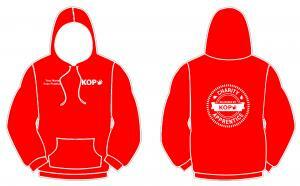 Fire Red pullover hoody with Arctic White interior hood printed with KOP logo on front. Charity Apprentice logo printed on back. Optional personalisation printed on front right chest.